There’s a lot of talk about how the newspaper industry is dying. And there’s some truth to this — NY Times is in debt, Seattle PI went out of business, etc. etc. Has our attention has shifted from newspapers to other forms of media? It seems like the answer to this is a resounding YES. But unfortunately, we’ve made a terrible trade off. We need to see different informed views on a subject. One voice means there’s only two views: for or against. This is a bad place to be, because any sufficiently complex issue needs to be looked at from a variety of angles before a reasonable assessment should be made. We need to have good local news. Without a good local paper, who’s going to call out the mayor on stealing money from the city? Who’s going to tell us that our schools are failing too many kids? Without a local paper, our communities are lost in the dark. The local TV and radio news will never have the same depth as a solid local paper. We need real news. In a world of hype, angry yelling, and ignorant opinions, newspapers have managed to maintain a calm and informed voice, for the most part. Occasionally, newspapers even engage in reporting real news and conducting investigations. Imagine that! So what’s wrong with the “new” news media? Why is it different than a newspaper? Blogs. Likewise, blogs do very little reporting and mostly tend to be humor or angry yelling (think Jon Stewart and Bill O’Reilly.) Those that do actual reporting have a narrow focus and only a handful of reporters. This is fine, but the idea doesn’t seem to scale. Blogs just don’t make enough money to be effective at covering an entire locale. Twitter. And how about Twitter? Come on. Twitter is a way for ADHD celebrities to communicate with their ADHD fans. If something can be said in only 140 characters, it’s not new and therefore not worth saying to an audience. Don’t get me wrong, the consumers of news are not entirely to blame. Sure, they should be demanding better news. We could (and should) all call up Glen Beck and Keith Olberman’s advertisers and tell them we won’t buy their products anymore. That would be a good start. But the news media needs to make changes as well. The newspaper industry is to blame here as well. Newspapers are looking quite thin these days, and the content remaining is not up to par. To sell papers, they need to make some big changes, particularly in the face of their boisterous competition. So what can the newspaper industry do? Do some actual reporting. This facet of running a newspaper seems to be lost on many. An opinion page is fine, but anything more than that and you run the risk of overshadowing your editorials with journalism. That said, the opinion page shouldn’t be a bunch of insane rants. If there are factual errors or obviousl problems with the reasoning, they simply should not be printed. Stop lying. Recently, Fox News was sued for reporting false information as news. Unfortunately, the ruling was in favor of Fox, because there’s no law against reporting false information. While we’ve all come to expect ridiculous lies from Fox, the newspaper business needs to hold itself to a much higher standard if they want to continue to command respect from their readers. But even at the NY Times, a reporter was fired for making up stories, and he wasn’t the only one. Who would trust a source who constantly lies to them? People stop subscribing when they’re lied to, and rightfully so. Investigate. When a newspaper reports on opinion polls and what someone said, it’s hardly newsworthy. Our world is filled with scandals, injustices, and other actual hard news. This is real journalism. Reporting on a car crash or whether babies should really be wearing diapers are not journalism. It’s that simple. Stop whining. Not a month goes by without a newspaper story about how nobody reads newspapers anymore. Maybe if the news reporters would do their job instead of whining constantly, they would get more readers. Crazy idea, huh? Must not be — the NY Times mentioned this idea in a story about (what else?) how nobody reads newspapers anymore. It’s time for the editors to tell their reporters to stop their whining. Get serious about the internet. Almost every newspaper has a website. But why? Most of them don’t make money or even have plans to make money on their website. The news organizations are stuck in the 1980′s, treating the internet like some exotic new thing instead of a real distribution format. If they have to charge for it, so be it. But the subscription model isn’t likely to work in a world of links and copy/paste. I’m not saying there’s a right answer to this. This is something the newspapers need to take a lot more seriously. Conclusion: even though newspapers are becoming worse and worse, they’re still the best news source we have, by far. And they probably won’t get any better until the industry takes a good look in the mirror. I was walking to my job in the SOMA district of San Francisco one morning, and I came across a strange poster. 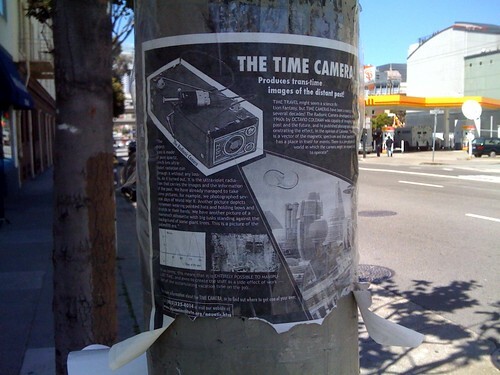 The content was completely off the wall — according to the poster, there was a camera that could see through time. 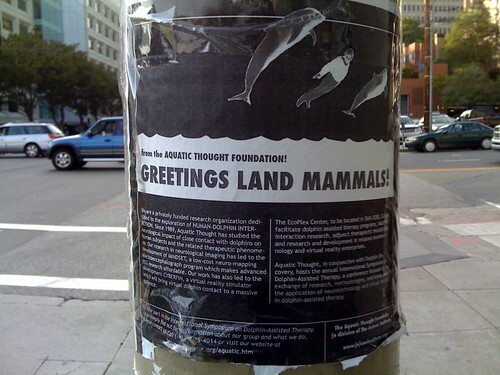 A few days later, I saw a similar advertisement for speaking to dolphins. 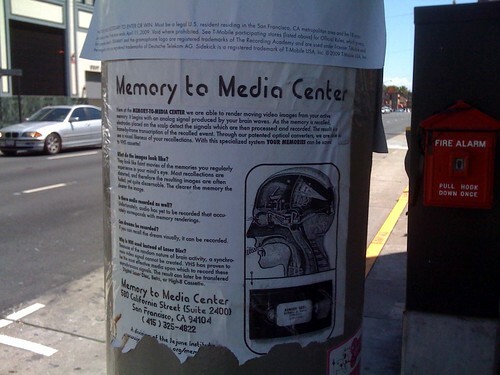 Finally, I came across this poster for recording your memories to a VHS tape. It was no surprise that all three posters had similar contact information and lead to the same people. Who was behind these crazy ads? I highly recommend visiting; I don’t want to give anything away, but it’s an experience you won’t soon forget, to say the least. Bring: $1 + tax, a cell phone, comfortable shoes, and an umbrella if it’s raining. Keep in mind there may be a 10-30 minute wait on busy days. You are currently browsing the MrEricSir.com blog archives for August, 2009.